Habitat: Marshmallow is native to Europe and Africa. 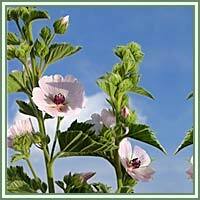 Description: Marshmallow is herbaceous, perennial plant, growing up to 1, 2 meters in height. It has a tap-shaped, woody root, whitish yellow outside, white and fibrous within. Its stems are erect, simple or with a few lateral branches. Leaves are thick, shortly petioled, ovate and heart-shaped, slightly toothed and covered with fine, dense hairs on both sides. The flowers are large, five-petaled, pale pink or pale purple in color. 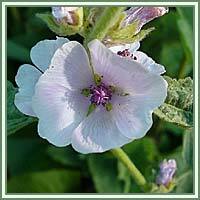 Marshmallow is in flower from August to September. Marshmallow fruit is flat and round, formed of numerous capsular carpels, circularly arranged around the axis. Useful components: Mucilage, asparagines, pectin, tannins, flavonoids, polyphenolic acids, scopoletin. Medicinal use: Marshmallow is considered to have demulcent, expectorant, diuretic, and emollient and vulnerary properties. Leaves are generally used in treatment of the respiratory and urinary system disorders, especially in cases of urethritis and kidney stones. As for the root (which has to be harvested in late autumn), it is considered very beneficial in treatment of digestive, skin problems, and infections of the mucous tissues. It can be very helpful in cases of inflammations of the mouth, coughs, gastritis, peptic ulcer, enteritis, and colitis. Used as a decoction, Marshmallow root is useful in cases of various ailments such as catarrh, pneumonia, gonorrhea, vesical catarrh, renal irritation, acute dysentery, and diarrhea. It has also been used to treat constipation and irritable bowel syndrome. Used externally the root can be of enormous help in treatment of varicose veins, ulcers, abscesses and boils.